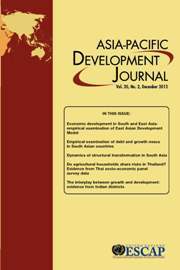 The Asia-Pacific Development Journal (APDJ) is published twice a year by the Macroeconomic Policy and Development Division of the United Nations Economic and Social Commission for Asia and the Pacific (ESCAP). The primary objective of the APDJ is to provide a platform for the exchange of knowledge, experience, ideas, information and data on all aspects of economic and social development issues and concerns facing the region and to stimulate policy debate and assist in the formulation of policy. The development experience in the Asian and Pacific region has stood out as an extraordinary example of what can be achieved when policymakers, experts, scholars and people at large harness their creativity, knowledge and foresight. The Asia-Pacific Development Journal has been a proud partner in this process, providing a scholarly means for bringing together research work by eminent social scientists and development practitioners from the region and beyond for use by a variety of stakeholders. Over the years, the Journal has emerged as a key United Nations publication in telling the Asian and Pacific development story in a concise, coherent and impartial manner to stimulate policy debate and assist in the formulation of policy in the region.